Increasing competition makes the cost benefit of a treatment a key measure of success. For a small company, robustness and manufacturability will be important factors for success in codevelopment and partnering options. For larger companies, the cost and time of revisiting process development later on is becoming more expensive and will become increasingly prohibitive. Trends are occurring that will support process optimization during early phase development. The first initiative is to develop the science and understanding of how to improve the success rates of candidates entering clinical trials by improving selection methods. The second approach relates to advances in robotics technology and the development of ultra scale-down (USD) techniques used to predict large-scale performance from milliliters of material (Photo 1). In the extreme, these approaches make scale-up factors of 3,000× possible (2). Linking predictive models to USD techniques creates the potential to screen and evaluate a large range of options and develop robust, cost-effective processes early in development. We are not there yet; it’s likely to be five or more years before we can develop total processes using USD techniques this way. It is possible to quickly screen routes now for selected unit operations (centrifugation, some aspects of chromotography). 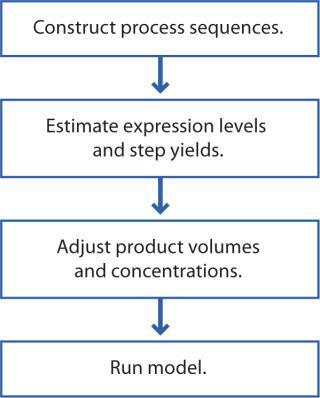 This approach will allow rapid screening early in process development, but it poses both opportunities and dilemmas that relate to how to interpret the results in the context of an industrial process. Some issues relate to each organization and the way it deploys cost data and models. Here are some issues to be addressed both at the organizational and process development levels: How does the organization as a whole reach a consensus regarding cost targets, and how are the decisions made? For chronic applications, how quickly can you come to a view on the cost benefit of a drug substance? When designing a new process, how do you avoid manufacturability pitfalls related to exotic chemicals and materials? And how do you support standardization of materials and methods used in process development? For example, use a standard buffer unless there is a good reason not to. Looking at the fit of a new process into existing manufacturing assets can help a company ensure the optimum use of those assets before committing to new capital expenditures. As process development addresses cost issues, it is important that a mathematical framework is developed to allow consistent structuring of information, with all assumptions clear and supported by a rapid, structured analysis of processes and related options. The mathematical framework should integrate USD models as they are developed, allowing for optimization of processes from laboratory-scale data sets. Higgins admitted, “We are probably in our infancy with cost modeling. Part of the challenge is that everyone needs answers for their core function, leading to different groups trying to proceed with their own tools.” Ideally, he explains, a single model should be used across the entire organization. But even with one model, refinement and eventual validation will be required to build confidence in its results. With a robust, validated cost and capacity model, key program assessments based on cost can be made even in the preclinical phase. Scott Willett, PhD, is director of biopharmaceutical development for Promedior, a small venture-funded company that is developing a single protein. PRM-151 (recombinant human serum amyloid P) is a potent modulator of monocyte differentiation both in vitro and in vivo, with a broad antifibrotic activity across tissues, models, and species, inhibiting excess scar formation in the healing process. ris and Escherichia coli, and also with reported purification of the protein from human plasma. For a company in preclinical development with a potential treatment for multiple, chronic, fibrotic indications, it is important to use cost modeling early on.” This helps to maximize the value in what will eventually become an optimized, cost-effective commercial process. To do so, Willett explained, Promedior needed to generate relative cost scenarios quickly and easily, provide useful comparisons of process scenarios, identify process design and performance issues, and screen potential process alternatives. This way, he went on, process development decisions could be framed by understanding where significant cost risks lie (Figure 1). “At the preclinical stage, it was our strategy to pursue three tracks in parallel: microbial expression in E. coli (inclusion body refolding and periplasmic); mammalian cell line development (secreted); and sourcing from human plasma (or plasma fraction). “However,” he told us, “this is not without its problems given the lack of hard process data. We found we were able to make progress by conducting an initial series of quick experiments comparing a number of microbial and mammalian expression technologies with the availability of sourcing plasma fractions for recovery process optimization. We then took that limited data set and made a set of assumptions to get an initial level of insight. To do this in a meaningful and consistent way, we relied on the BioSolve process and economic modeling platform, which allowed us to rapidly evaluate a variety of scenarios and conduct sensitivity analyses to facilitate process comparisons.” By using typical process sequences and parameters coupled with early available process data, Promedior could adjust the process model to create a plausible base case. “We looked at four process models,” said Willett. These included a Chinese hamster ovary (CHO) cell culture producing secreted protein; microbial inclusion bodies refolded by either detergent solubilization and Tris buffer dilution or GdHCl solubilization with an arginine buffer dilution; microbial periplasmic secretion; or naturally sourced product from human plasma. “We were then able to examine the impact of increasing scale (200 L up to 10,000 L) and evaluate the impact of disposable technologies. This gave us the basis to conduct sensitivity analyses.” For those, Promedior focused on disposables, scale, product titer, the number of bioreactors required, and capacity use. “So what did this tell us?” he went on (Figure 2). “As expected, the microbial processes are generally less costly per batch. However, the GdHCl–Arg refold process is materials-intensive at large scale, so refolding from E. coli is the most economical choice only without the GdHCl–Arg system. Further, the large-scale plasma process is also cost prohibitive, so sourcing from plasma is clearly not a viable alternative.” As Promedior expected, increasing product titers represent a major benefit for cost of goods sold (COGS), “so it is important to take time to develop an appropriate cell line that is amenable to large-scale cell culture and to work hard early on to maximize expression levels.” Also as expected, scale has a major impact on COGS, but Willett said it is important to use modeling to understand cost drivers as a function of scale in a process so that potential cost issues can be addressed early on. In response to the changing business environment, both small and large organizations need to look at cost drivers while developing a bioprocess. The cost of manufacturing drug substance is becoming an increasingly important factor for success. Tools used need to be fit for their purpose, and the whole business needs to be involved in related decision making. Willett’s interview highlights that cost is an important criteria even for smaller companies developing single products — especially important when a drug candidate is being used for a chronic application or is entering a highly competitive environment. None of this would be possible without easy-to-use mathematically based models. They offer the means to achieve consistency of methods, to share process and cost data, and to rapidly evaluate options. The industry is at an early stage of integrating process development, quality by design (QbD), and costs — so the potential for improvement in reducing risk and cost is significant. 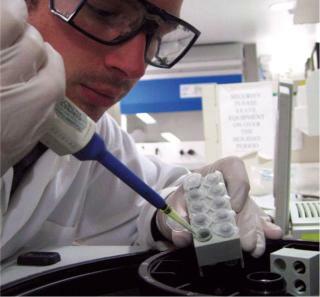 Integrating USD experimental techniques with robotics and models such as the BioSolve package will offer a means to achieve that potential and provide precious insights into bioprocesses throughout the product lifecycle. Corresponding author Andrew Sinclair is cofounder and managing director of Biopharm Services, Lancer House, East Street, Chesham HPS 1RD, United Kingdom; 44-14947-932-43, a.sinclair@biopharmservices.com. Miriam Monge is vice president of marketing and disposables implementation at Biopharm Services; m.monge@biopharmservices.com. 2.) Tustian, AD. 2007. Adapted Ultra Scale-Down Approach for Predicting the Centrifugal Separation Behavior of High Cell Density Cultures. Biotechnol. Prog. 23:1404-1410.